We're blessed with the support of key advisors with decades of experience in the food, restaurant and fishing industries. Chef Lupita Vidal is a chef and native of the state of Tabasco, Mexico and is the owner of La Cevichería restaurant in the capital Villahermosa. Lupita was the first chef to take us up on our proposal to serve the pez diablo and is a close friend of the company. We work together in education and awareness events to promote the consumption of the fish and Lupita advises us on new dishes with the fish. Lupita also sells her famous pez diablo burger in her restaurant which has become a hit across the region. Alisha brings nearly 15 years of food and sustainability marketing and communications experience, with a particular specialty in seafood. Named a ‘Tastemaker’ by Food & Wine Magazine, she knows her way around food trends and product positioning. She has worked internationally with farmers, fishermen, distributors, chefs, retailers, hospitality groups, NGOs, and government to create strategies, forge partnerships, and help get compelling stories to the right ears. She is most recently a founding partner in Polished Brands, a boutique marketing and communications agency that has drawn clients from European government trade commissions, private companies based in five countries, venture capital, NGO projects, and four feature films. Born in Minneapolis with a wandering spirit, David has lived in Micronesia; Austin; Texas; Cancun and Xcalak Mexico; and Aspen, Colorado, in between visiting locations as diverse as Anse-pitre, Haiti and Sioux Lookout, Ontario. As a serial entrepreneur David is proud to have invented the first solar heated fish house (for ice fishing in Minnesota), authored the world's first computer generated fishing maps (1987), and received a provisional patent on the Lionfish Smarttrap (a selective object recognition fishtrap). 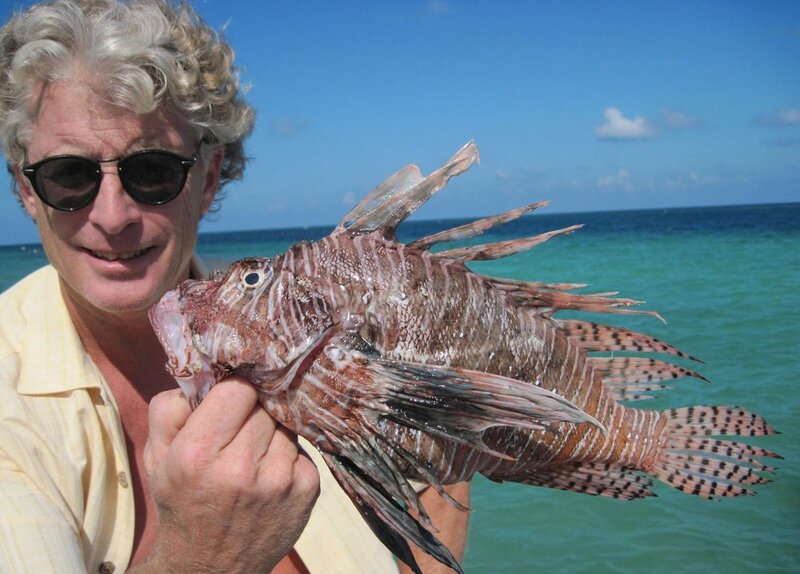 After creating a logistical cold chain from remote areas of the Mexican Caribbean, David launched, at the time, the world's first and only Lionfish distributorship in 2013. With fishing, and conservation as the obvious drive behind his efforts, David is thrilled and honored to now be associated with Acari's efforts to turn the Devil Fish into a job producing, conservation advancing, and healthy eating opportunity. He sees great promise in fashioning an invasive liability into a productive asset. Alex is a native Floridian pursuing his entomology PhD at the University of Florida and Florida A&M University, where he works on the ecology and evolution of aquatic insects. He received his BS and MS degrees in biology at the University of Central Florida. His previous work has dealt with trophic ecology of Amazonian electric fishes and the ecology and impacts of exotic catfishes. Alex has extensive field experience in the Neotropics and the southeastern USA. He is excited to provide a scientific perspective in transforming an invasive menace into an economically and ecologically sound venture.